https://matcha-jp.com/en/5506 Muslim-Friendly Yokohama - Wear A Kimono And Enjoy Tea Ceremony! In addition to its cutting-edge attractions, Yokohama offers visitors the chance to experience traditional Japanese culture. This time we introduce a Muslim-friendly itinerary that includes wearing a kimono and a tea ceremony at Sankeien Garden. Yokohama, Japan's leading port city has been the country's gateway to the world ever since its opening at the end of the Edo period (1603 - 1868). It is a fascinating travel destination offering modern facilities and exciting attractions, as well as traditional Japanese culture. In order for everyone visiting Yokohama to feel welcome and enjoy their trip, many public facilities have prayer rooms which can be used by Muslim travelers. There are also many dining places that offer Halal certified food or vegetarian and alcohol-free dishes. 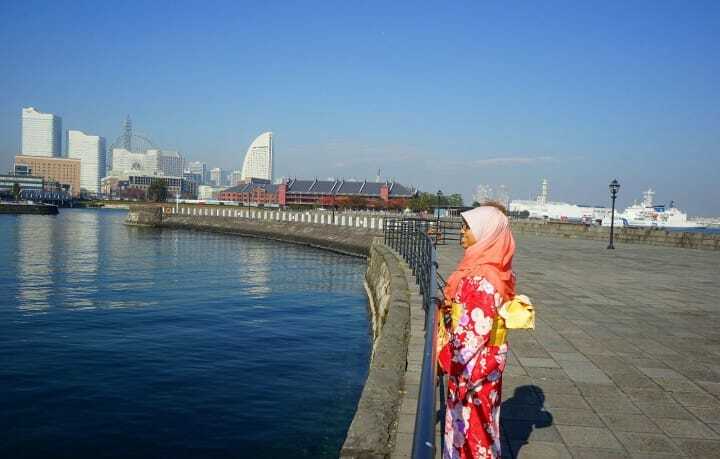 This time we will be introducing a model course for a day trip to Yokohama for Muslim travelers who would like to experience traditional Japanese culture. Our reporter will be Fifa, a Malay student who has been living in Japan for four years. The route introduced in this article allowed Fifa to experience wearing a kimono while enjoying a leisurely walk through Yokohama, as well as taking part in a tea ceremony at Sankeien Garden, one of the most beautiful traditional gardens in eastern Japan. 10:30 -- Put on a Beautiful Kimono at Yokohama Kimono Station! Wearing a kimono is the best way to have a firsthand experience of traditional Japanese culture. Yokohama Kimono Station is the facility we would like to recommend to you to visit in Yokohama. Located within the Silk Center, a 3-minute walk from Nihon-odori Station, this kimono rental shop boasts a collection of over 100 kimonos and accessories you can choose from. The kimonos are authentic and elegant, with gorgeous patterns. Female customers can choose between regular kimonos, yukatas (summer kimonos), furisode (formal kimonos) and hakama (a kimono set recommended for active persons who plan to walk around a lot). You can rent a kimono for several hours and go strolling around the city wearing it. Please be aware that the kimonos should be returned by 17:30, before closing time, otherwise you'll be required to pay the rental fee for the following day too. Professional fitting staff will help you select your kimono and put it on. For Muslim customers, the staff will make sure that the kimono looks good in combination with the headscarf. Fifa chose a beautiful red kimono with flower patterns. It was the first time she wore a kimono so she was very excited to see how it would look on her. The staff at Yokohama Kimono Station will happily offer a space for prayer to Muslim customers, making sure that they can observe their ritual in privacy. Please ask the staff to guide you. Languages The staff can talk to the customers and answer e-mails in simple English. Telephone communication is performed in Japanese. Price Kimono rental and fitting fees: Ladies - Kimono 5500 yen, Yukata (summer kimono) 5500 yen, Hakama 9000 yen, Furisode (formal kimono) from 14,500 yen. Men - Kimono 5500 yen, Yukata 5500 yen. Children - Kimono 3500 yen, Yukata 3500 yen. Fifa looked really beautiful in her kimono so we went out in the park to take pictures of her with the cityscape in the background. What better memories of your trip to Yokohama than pictures of yourself in traditional Japanese attire with the port in the background? There are actually two parks located very close to the Yokohama Kimono Station. One of them is Zo no hana Park, which offers a great view of the port and of the Red Brick Warehouses, one of Yokohama's landmarks. It's only 3 minutes away from the Silk Center. The second great location for memorable photos is Yamashita Park. From here you can enjoy the view of Yokohama's famous buildings, as well as of the ships and of the wide ocean spreading before your eyes. Yamashita Park is one of the favorite leisure spots of Yokohama citizens and a famous sightseeing spot at the same time. Shortly before 12:30, we returned the kimono to the Yokohama Kimono Station and took the subway to Minatomirai Station, which is close to the restaurant where we planned to have lunch - Amataro Minato Mirai store. Amataro is a popular dining place with several stores in Yokohama. We visited the Minato Mirai store which is located on the second floor of the Mitsubishi Industrial Building, just 5 minutes away on foot from Minato Mirai Station. At Amataro, if you request beforehand, they can make a menu with vegetarian and alcohol-free ingredients. Priced at 1500 yen, this set meal contains a hot tofu dish, udon, vegetable tempura, tofu steak, salad, pickles and rice. A drink bar is also included in the price, allowing the customers to enjoy how many drinks they wish together with their meals. Fifa really enjoyed this meal which gave her the chance to taste so many authentic Japanese flavors. She warmly recommends it to fellow Muslim travelers who would like to try Japanese food. Religion Vegetarian and alcohol-free menu available upon request. After lunch, head to Sakuragicho Station, which is about 9 minutes away from Amataro. From platform No.2 of the bus terminal in front of the station, take bus No. 8 headed to Honmokushako-mae. The bus departs at 14:35. After a 26 minute ride, get off at Sakuramichi bus stop. From here it takes only 3 minutes on foot to reach Sankeien, Yokohama's celebrated Japanese garden. When we visited, the garden was covered in amazing autumn colors that provided us with the perfect background for some memorable pictures. Starting with its iconic three-storied pagoda, which watches over the garden from uphill, in Sankeien you will be able to see various traditional Japanese buildings: houses, temples and tea ceremony rooms. They offer precious insights into how the Japanese used to live in the past. In the Sankei Memorial Hall there is a tea ceremony space called Bototei, where visitors are welcome to enjoy matcha tea and traditional sweets (500 yen). Even the sweets are decorated with the symbol of Sankeien, the three-storied pagoda. If the venue is not very crowded, you can ask to be allowed to actually prepare tea yourself! Under the guidance of the tea ceremony sensei, Fifa actually prepared a bowl of matcha tea ceremoniously. She learned about how much care is put into choosing a bowl that reflects the features of the season, and how carefully is the tea prepared before it is being offered to the guests. She really liked the tea which tastes especially good after one eats the special sweets. Afterwards, Fifa told her that being able to take part in a real tea ceremony was an enriching experience that made her wish to learn more about the depths of Japanese culture. In the lobby of the Sankei Memorial Hall, there is a souvenir shop where they sell various types of traditional sweets. You can even find the tea ceremony sweets available in a pack of nine pieces for 600 yen. It's a great souvenir from Sankeien Garden! At Sankei Memorial Hall (Sankei kinenkan), Muslim visitors are offered a prayer space together with a prayer kit (compass and rug). Please ask at the entrance and you will be guided to the room. Religion Prayer space for Muslim visitors available upon request. To go back to Yokohama Station, you'll need to take the bus from the same bus stop you used when you arrived, Sakuramichi. Bus No. 8, departing at 17:07, will bring you straight to Yokohama Station. The ride takes around 33 minutes. Enjoy Your Time in Yokohama! Yokohama is a city with many exciting places to visit. If you would like to experience traditional Japanese culture, how about wearing a kimono and taking part in an authentic tea ceremony at Sankei Garden? Many facilities in Yokohama are provided with prayer rooms and Halal-friendly dining facilities, so Muslim visitors can be at ease when choosing Yokohama as their destination. You will most surely have a great time in this city!